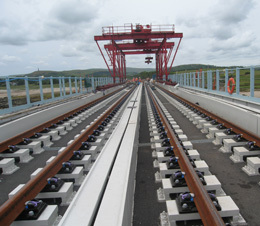 Aspinalls - Carillion Rail - UK Engineering Experts | Engineering Business UK | Qualified Engineers Lancashire | Mechanical Engineered Products | Mechanical Engineer Services. 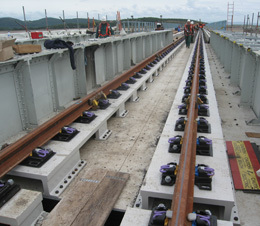 Aspinalls supplied and installed 50 tonnes of BS5400 compliant intricate replacement bridge deck plates, rail pedestal steel, walkway steel and covers, cat ladders and pier prop assembly steelwork, on the award winning Leven Viaduct Carillion Rail Project. 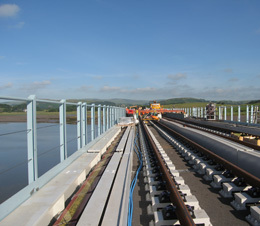 The project was awarded the Institution of Civil Engineers North West Region 2007 merit award for engineering excellence. 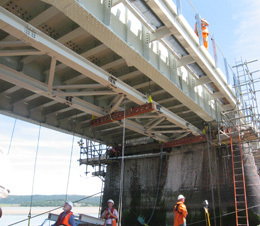 The installation phase was coordinated to stringent time frames which demanded 24 hour cover during Aspinall’s 6 week installation period. 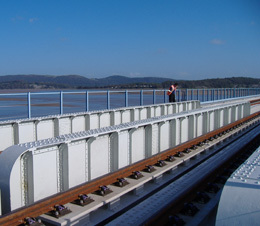 The viaduct is on the Carnforth to Barrow West Coast Main Line and at 460m long carries trains across the River Leven Estuary in Morecambe Bay. 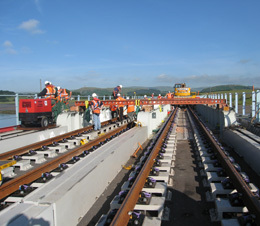 Network Rail have now predicted the life of the historic viaduct is good for another 150 years !